This post is part of an upcoming series of four posts on American 18th & 19th cent. Gothic novels. I have to read them in preparation for my final exams at university. If you now think, “Oh dear God no, how boring, I had to read that stuff in school,” be at ease, it’s just four reviews. And still, these books give me the creeps. Okay, I’m scared easily. You see, these writers laid the foundation for all those great books you are reading now. 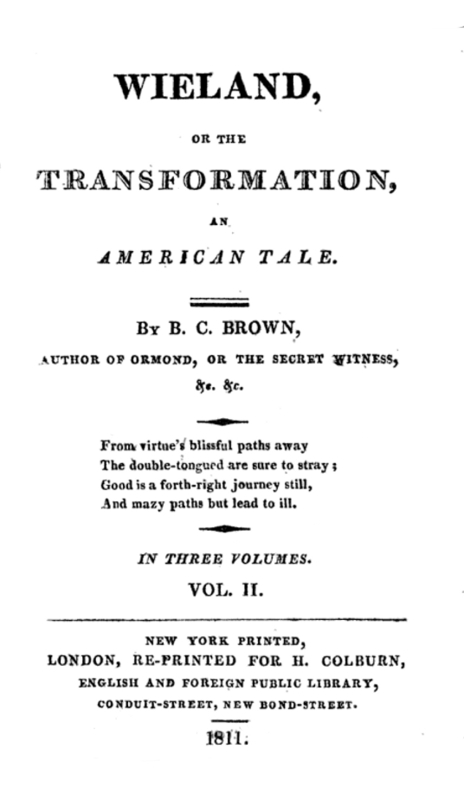 This first review is about Charles Brockden Brown’s Wieland, or the Transformation, an American Tale which was first published in 1798. Clara Wieland lives in a house on her brother’s estate in Mettingen, Pennsylvania. When they were children, the siblings’ father died a mysterious death. Now, the inhabitants of the estate start hearing strange voices and soon after, a brutal murder takes place. Wieland leads us to 18th century Pennsylvania and a great part of the novel is set on the Wieland family estate. Charles Brockden Brown created a grey and dreary setting that is perfect for what’s about to happen. While reading, I sometimes imagined that the Wieland estate could easily be the setting for a much happier story. The estate would feel completely different, by just changing the right words. But we don’t need that for Wieland 😉 . The events that take place are told by Clara Wieland, sister of Theodore Wieland. Clara is a very brave and smart woman. Sometimes her actions are so brave that they can be classified as plain stupid. When I gave it some thought though, I noticed that it was somehow strange that this brave woman falls gravely ill every time someone tells her something shocking. That doesn’t make sense. Nevertheless, I never doubted the female voice Brockden Brown used to tell this story. Charles Brockden Brown starts his novel with an introduction of the characters and their background. It takes some time for the story to get going but when it finally does, it’s full of suspense (at least if you have no idea about the outcome). In the end, everything seems to be clear. However, when you think about it, a few things just don’t add up. Wieland is a novel for those who are bored with today’s thrillers and those who want to see how the American Gothic novel started out.